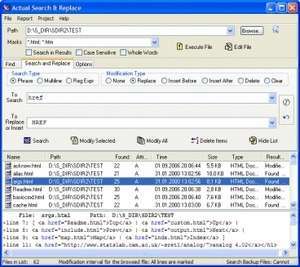 This tool provides search-and-replace operations across multiple text files. You can search documents for a phrase or several words, multi-line or regular expressions, and use the search engine's style queries. The preliminary search, ability to undo changes and the backup feature help the user easily control the process of modifying files. The program also supports a command-line mode. Actual Search & Replace 2.9.3 is a shareware program and can be used as a demo to try the software until the free trial period has ended. A full version of the program is available after the trial period ends. For security reasons, you should also check out the Actual Search & Replace download at LO4D.com which includes virus and malware tests. Additional screenshots of this application download may be available, too. Actual Search & Replace has a presence on social networks.